A Tough Round 5 Encounter Awaits! Those in early to the Austin Stack Park last Sunday were treated to a seat in the stand and a magnificent display of hurling. The win was enjoyed by Kerry Supporters who rightly stood and clapped the hurlers off the field. Unfortunately, the second game saw the footballers come out on the wrong side of the scoreboard. Galway proved to be a tough opposition who never relinquished their lead throughout the game. After 4 rounds, we have two wins and two losses but the positive that has to be taken from the league campaign so far is the large number of young players that have seen game time. That can only be a good thing come championship time! 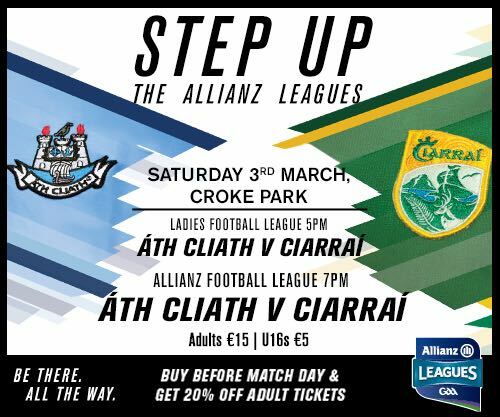 Next weekend a very tough challenge awaits as we travel to Croke Park to play Dublin in the round five encounter. Last year we faced Dublin twice in the league and both were superb games. The first was a meeting in Tralee that ended in a draw and the final saw us winning by the bare minimum. Dublin are top of the Round 1 table having won all 4 games and Kerry will relish the challenge of taking on the All Ireland Champions in Croke Park. Tickets are on sale in Centra, Supervalu and in the Kerry GAA Store, Killarney. Purchasing before midnight on Saturday means a saving of €3 per adult ticket. The only word of caution is the weather, at the moment the game is going ahead as planned and hopefully ‘the Beast from the East’ won’t change our weekend plans!